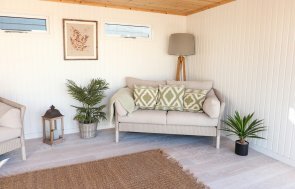 The Salthouse Studio is one of our more modern styled garden buildings, and it looks great in our customer’s garden where it has been installed in Newbury, Berkshire, not far at all from our Newbury show centre. Salthouse Studios are very often bought with the intention of using them as an office space or a creative studio space; however they can look very nice when furnished as an extension of your home for a relaxation room as well, and that is exactly what this customer has in mind for their new garden building. Seeing the Salthouse Studio decorated in such a manner at our Newbury show centre inspired them, and they even enquired about the white wicker sofa we have in there for their building. So, now they have it installed in their garden, they can really start planning how they’re going to furnish it. This particular Salthouse is 2.4 x 3.6m in size, and on the outside the customer wanted black guttering, which goes around the back of the studio, and Valtti Lizard paint on the timber. Lizard is a very popular colour for our garden buildings because it looks so natural, especially when paired up with gardens abundant in greenery and flowers. Customers get the option of either having chrome or polished brass door furniture for the door handle and door hooks on our studios, and this customer chose polished brass for their door fittings, which looks really nice with the paint colour. On the inside of the studio, the customer opted for painted matchboard lining and insulation, heavy duty flooring with a Light Oak lacquer and an electrical pack. As standard, the Salthouse also comes with full insulation in the ceiling, floor and walls, lockable window fittings (for the fan light windows on the back wall), draught excluders in the doors and windows and double glazed glass throughout. These features all indicate a strong, purpose-built garden building that is highly durable and is suited to all year round use, and we hope our customer has many an enjoyable day and evening, whatever the weather, relaxing in their new Salthouse Studio, overlooking their lovely garden. 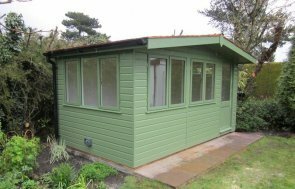 If you would like a year-round usable garden building of your own, have a look at our range of Garden Studios, Garden Rooms and Summerhouses to see the styles and options you can have with our buildings to make one your own. If you have any questions about your requirements at all, please don’t hesitate to contact us or call us on 01760 444229; one of our helpful team will be able to answer them for you and go through your requirements with you.